When "Cats" opened in London's West End in 1981, who knew it would play for 21 years. A Broadway production followed in 1982, picked up the Tony for Best Musical and went to run for 7,486 performances, making it the longest running musical in Broadway history at the time. (It would be surpassed by "Phantom of the Opera" in 2006, but still ranks as #2). In those days, the tagline for "Cats" was "Now And Forever." While the show would eventually close its main companies on both sides of the Atlantic, touring productions would continue to fulfill the slogan. And one of the many tours circling the globe stopped in Boston for a brief one-week run at The Colonial. 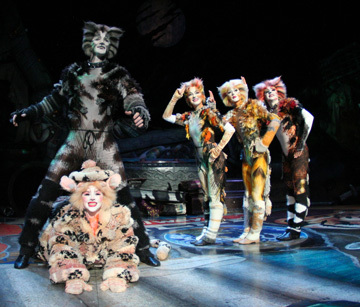 Written by Andrew Lloyd Webber and Tim Rice, "Cats" is based on T. S. Eliot's Old Possum's Book of Practical Cats. While sung through, this is a show that's all about dance. Trevor Nunn's original direction was sharp and precise while Gilliam Lynne's demanding choreography was graceful, athletic and totally in keeping with the feline mystique. Richard Stafford directs and choreographs with that in mind for the tour. The premise of the show is as thin as a whisker. On one very special night every year, an assortment of Jellical cats gather in a junkyard to vie for the chance to be re-born. Led by Old Deuteronomy (Philip Peterson), the patriarch of the group, the dusk to dawn gathering allows us to meet and learn the stories of all those in attendance. They include: Rum Tum Tugger, the hip-swiveling tom cat lothario (Adam Steiner), Gus, the old stage door cat (Nathan Morgan); Jennyanydots, a chubby, tap-dancing gumbie tab (Jennifer Cohen); Skimbleshanks, the railway cat (John Jacob Lee), the magical Mr. Mistoffelees (Chris Mackenthun), Bustopher Jones, an officious old guy fond of spats (also Nathan Morgan); and an inquisitive team of cat burglars, Mungojerrie (Brian Bailey) and Rumpleteazer (Kristen Quartarone). The outsider of the group is Grizabella (Anastasia Lange, at left), the former Glamour Cat who's now on her last legs. The others shun her tattered coat and dwindling energy. You can, of course, seeing where this is going. 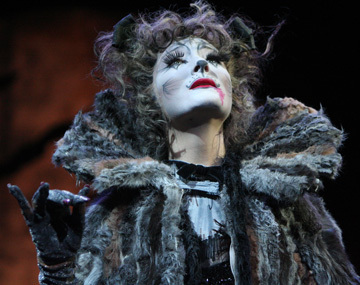 Grizabella makes her case, through "Memory," and is chosen to return to the "Heavyside Layer" to begin life anew. I saw "Cats" in London and New York as well as on tour, and if this company, in the larger ensemble numbers, is not absolutely in sync with every move, they dance with precision in their solo turns and are in fine voice. The costuming, designed by John Napier, is incredibly imaginative as is the make-up. As well, the actors prowl the stage and the aisles of the orchestra section, curiously examining audience members while preening, grooming and giving the occasional hiss. Each character is unique, as is each member of the chorus. All in all, they do a fine job giving life to their fascinating feline counterparts. There's also plenty of lighting effects (by David Hersey), strobes and smoke in the air, along with the mechanics to give the end of the show a boost. It's also important to note that "Cats" was created long before "Phantom" and "Miss Saigon" and "Les Miserables" and all the mega-musicals that would follow with staggering stage effects. When "Cats" opened, it was different than almost anything audiences had ever witnessed before. In that respect, it's still an ingenious idea, executed with style. The dancers are quite a bunch, with special note going to Chris Mackenthun who does a dazzling job as the black and bejeweled Mistoffelees, Tug Watson as Munkustrap, who welcomes us to the proceedings; and Brian Bailey and Kristen Quartarone who do a zippy set of windmill cartwheels as the cat burglars. Also of special mention is Sarah Bumgarner as the lithe and snowy white Victoria. Nathan Morgan plays Gus the stage door cat in two versions -- old and young. His sequence also allows us to leave the junk yard, if only temporarily, to see him star (in his memory) in a Gilbert and Sullivan-esque musical complete with Siamese Cat Soldiers. He is especially touching as the old-timer remembering his youth. Plus, he's got a powerhouse voice. "Memory" has become one of those theater songs that's been overdone to the point of cliche. But Lange gives it both meaning and power. The hiccups in the show are few, and they're structural. The spectacular solo by Mistoffelees comes too late in the second act. Just when the show should be moving towards a resolution, yet another character is singled out for introduction. And the "Addressing Of Cats" finale is both anticlimactic and drawn out after the emotion of "Memory" and the journey of Grizabella to the other side. But "Cats" has its own version of nine lives and after almost 30 years continues to entertain new audiences while pleasing those who return for yet another look. So I guess the original tagline was on the nose -- "Cats" remains now and forever. 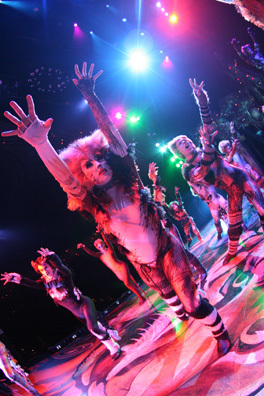 "Cats" is at the Colonial Theatre through April 18. For information, call 800-982-2787.